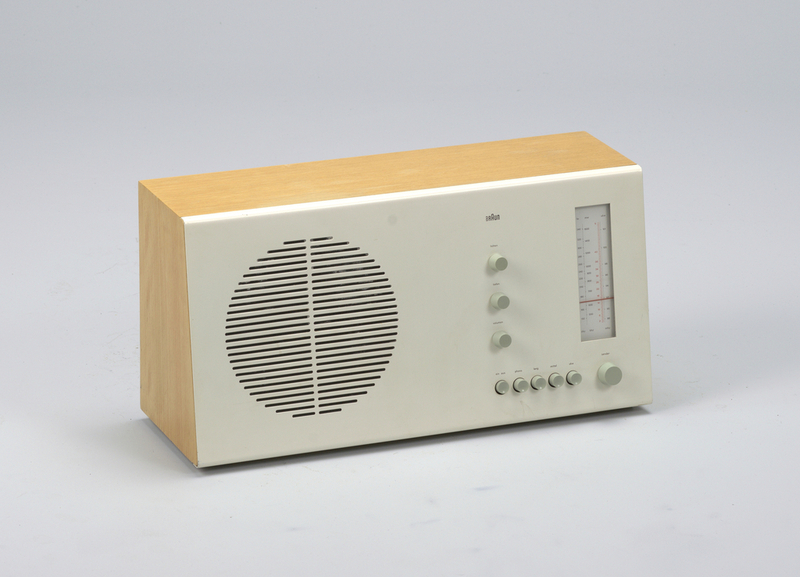 Designed by Dieter Rams in 1961, the Tischsuper RT 20 Radio is a perfect reflection of Rams’ maxim “Less, but better.” While this radio is undeniably modern, it is not austere. Rams’ use of the serene colors cream and laurel green create a design that exudes a natural sense of calm. Moreover, the gently sloping buttons and knobs and the warm honey-toned wood make this radio inherently tactile. The name “Tischsuper” or “great-Table” in English perhaps refers to how this radio is a movable object that can migrate from table to table. During the 1940s, radios were static, and normally one whole household shared a single radio. However, the new technological invention of the transistor meant that radios could be portable as well as affordable. This innovation meant that the radio became a dominant player in the youth culture in Germany, as the German Beatniks, (know as the “Halbstarkens”) began to listen to controversial music like rock ‘n’ roll. Worldwide, the desire of the younger generations to reject the staid values of their parents led to the manufacture of inexpensive objects with a shorter lifespan. As this insatiable consumerism rose in the 1960s, plastics became a fundamental design material. Everything from clothing to furniture was created out of plastic, and many objects were planned to be disposable. Rams was in direct opposition to this design culture that was ruled by novelty and kitsch. While Rams did employ the new medium of plastic in this radio, he strove to create objects that would be timeless. Rams was student of the Ulm School, which was the successor of the Bauhaus School founded in Germany through funding from the Marshall Plan. While at the Ulm school, Rams and his fellow classmates wrote the 10 Principles of Good Design, which outlined the philosophy of creating democratic design. For example, the tenth principle of this manifesto states that good design should be “as little design as possible.” Rams had a chance to test out this methodology in 1956, when Braun, a firm that produced everyday objects, hired him. Braun promoted Rams to the position of head of Product Design in 1961, a post that he would hold until 1995. Throughout his life, Rams sought to transform the burgeoning field of industrial design through creating objects that were as useful as they were aesthetically pleasing. This is reflected in the Tischsuper, as every design element of this object reflects its essential purpose without any excess ornamentation. See the Tischsuper currently on view in The World of Radio. Penny Sparke, “Plastics and Pop Culture,” in Sparke, The Plastics Age: From Bakelite to Beanbags and Beyond, Woodstock, N.Y.: Overlook Press, 1993, 94. Elizabeth Muir is a graduate student in the History of Design and Curatorial Studies program at the Cooper Hewitt, and is a Fellow in the Product Design and Decorative Arts Department. She is primarily interested in 20th century design and decorative arts. I’ve loved the Cooper Hewitt since I visited in the early 1980s. Went specifically to view the “Casablanca” exhibit and fell in love. It was a terrific exhibition as were all the exhibits I witnessed that day. Wish I could see the “Jazz” exhibition going on now….but viewing everything here is the next best thing. Thanks again for your exquisite and inspiring Museum.